Lydia has been teaching private violin and viola lessons in Northern Virginia for more than 25 years. Her teaching philosophy emphasizes learning correct technique in a kind and compassionate manner. Her education includes studies with two members of the National Symphony and extensive Suzuki Teacher training courses. 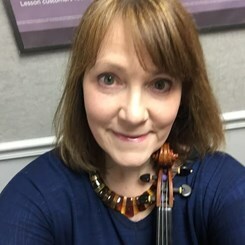 She has taught orchestra in Fairfax County Public Schools, and she has been a judge at FCPS's Solo & Ensemble Festival. Over the years, she has performed in numerous orchestras and string quartets. Lydia enjoys all kinds of music but classical violin is her favorite! Request Lessons with Lydia Klene today!